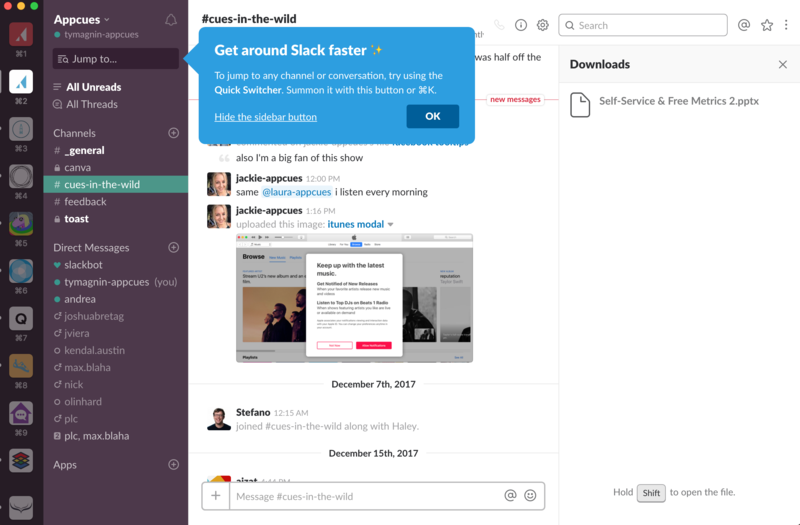 Slack offers an online workspace where teams can chat and send messages about projects and updates. As a team tool, channels can get congested and information can get buried. That's why Slack has a search — or “Jump to...” — feature. To make users aware of this search feature, Slack displays a small tooltip that demonstrates the purpose of the feature. Slack demonstrates the value of the feature in the bolded headline of the tooltip. “Get around Slack faster” lets users know what they will get out of the tip that Slack is sharing. Slack not only does points out the search bar but also offers a keyboard shortcut for jumping to a different channel, which would prove useful to someone wanting to quickly find a specific channel. As a bonus, they include a link to information on how to hide the app's sidebar. Including this tip makes sense since the tooltip's feature takes place in the sidebar in the first place. If users wanted to hide the sidebar, they could still use the keyboard shortcut to find a channel. GitHub's tooltips highlight new features, provide links to related support articles, and give helpful tips so users can get more value from the platform. Hipmunk organizes data into an interactive table that users can customize to their specifications, so they can feel more confident about their choices. It is Airbnb's ongoing optimization—to make booking accommodation even easier—that keeps its users coming back.